It’s going to be a soul-crushing experience in January for much of the AFC. At the current moment 11 of the conference’s 16 NFL teams have winning records, but just 6 of them will reach the playoffs. That means that nearly half of the teams that are currently feeling quite good about their season won’t even get to watch their teams compete in a playoff game! Let’s take a look at who will be figuring to come out of this mess with a postseason berth and who will be looking back at the month of December and wondering what happened. First, let’s take a look at how this strange scenario has come to be. One thing odd about the AFC (and the entire NFL) this year is that no team has dominated up until this point. The best teams stand at 9-3, which is only a 75% winning record. While good, when we realize that these are the league’s current strongest teams we have great parity. But at the other end of the standings lies the dark truth. 4 AFC teams have become the dreaded whipping boys of the conference. The New York Jets, Tennessee Titans, Jacksonville Jaguars, and the Oakland Raiders all sit poorly placed at 2-10 or worse. Their overall atrociousness has been gifting all the other teams easy victories, which is in large part responsible for the current situation. However, while some of these AFC teams’ wins may be unjustified, the fact that so many are winning will set up for an enthralling December! What’s truly astounding about these records is that typically strong teams like the New England Patriots and Denver Broncos have very little wiggle room in the upcoming weeks. Tom Brady and the Patriots are just 2 games ahead of both the Buffalo Bills and Miami Dolphins (both at 7-5). With games against both teams, New England could possibly lose their division lead and perhaps even a playoff spot! While I certainly doubt that will happen, the very possibility of it this late in the season speaks to the conference’s strength and equality. It’s also worth noting that many of these 7-5 teams are going to be playing one another and their records will balance out. An intriguing situation has developed in the AFC North, where the Cincinnati Bengals hold a 1.5 game lead over the 7-5 Baltimore Ravens, Cleveland Browns, and Pittsburgh Steelers. Each team could conceivably win the division or finish in 4th! While a Browns surprise would be delightful, I suspect the Bengals should hold onto the lead. Elsewhere, I expect the Broncos, Patriots, and Indianapolis Colts to hold onto their division leads while the San Diego Chargers and the Baltimore Ravens should claim the wildcard sports. However, with these wildcard opportunities still hotly contested, the final weeks of the year will be extremely entertaining as the stakes continue to grow. For all the contending teams of the AFC, the playoffs are basically starting right now. No one can afford to slip up and it’s all up to play for. While the current mass of 11 winning teams lopped in the conference will certainly change in the next month, those who do reach the NFL playoffs will have earned their tickets! No matter which AFC team you root for, AAA Sports Memorabilia has a collectible for you. 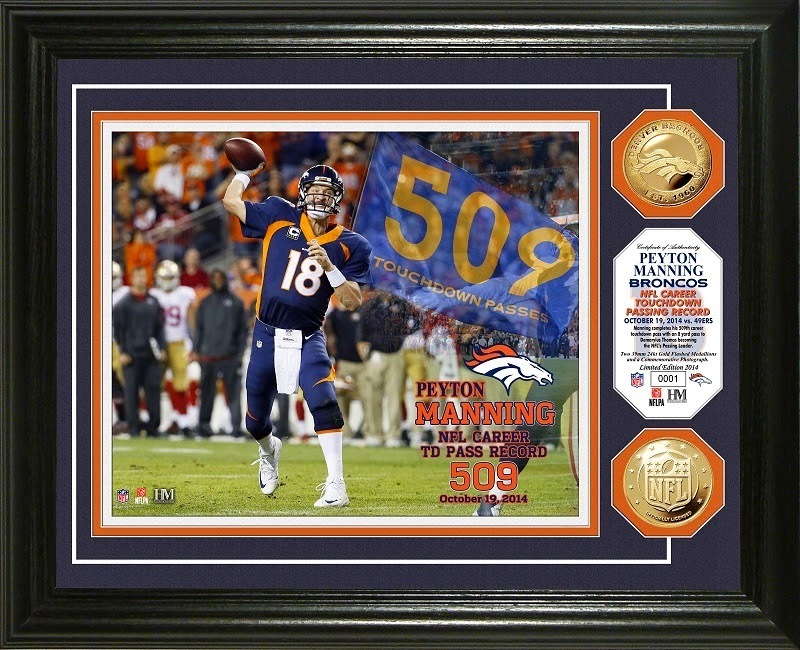 We carry only the finest collectibles that are officially licensed by the NFL. Our specialty is autographed sports memorabilia that are hand signed by your favorite athletes during paid private appearances. Our autographs are guaranteed for life to authentic and are backed by the most trusted companies in the industry. AAA Sports Memorabilia also carries display cases made right here in the USA to showcase your collectibles. Visit us often as we are continuously adding new products.